Don’t like the law? Are lawsuits hampering your ability to pass symbolic ordinances to emotionally satisfy the intellectually challenged? Are unruly citizens trying to take safety into their hands? Just change the law! Remember last year when the Las Vegas Clark County Library District tried to make libraries into gun-free zones like schools? That was because citizens dared standup to their long-standing illegal gun ban. They posted “no guns” signs as if they were some magical rune that would ward off crime, but also kept legal concealed carry out. When armed citizens dared openly carry, they told gun owners to pound sand and had a mom arrested. Now, we are depending on the judiciary to do the right thing and respect the law. Will they? We don’t know. If California and the Ninth Circuit are any indication, gun owners and armed citizens cannot expect the courts to bail us out every time. Legislation is no bulwark either. A Democrat trifecta (governor and both houses of the legislature) can wipe preemption off the books, all in the name of “doing something” about gun crime. In the wake of October 1’s Mandalay Bay shooting combined with the manufactured post-Parkland hysteria every weak-kneed Republican and Democrat sucking at the liberal machine’s teat will fall all over themselves to “do something.” For a lawmaker, that means making new crimes and repealing past protections. Democrats want to take away state preemption. Yvanna Cancela has requested a bill to that effect, probably because Las Vegas and Clark County couldn’t pass a pointlessly symbolic ban of bump fire stocks. And they wouldn’t stop at mere symbolism either; despite harsh penalties, Leon County, Florida, passed it’s own local gun ordinance. We need to take the offensive. Let’s hit back and make preemption stronger. Put the law-breaking politicians in jail and keep them out of public office forever. Make them too terrified to even propose this stuff. Not only do the statutes need to be amended (or better yet, compiled into a single statute to remove ambiguities) that preemption applies to all government entities, we need to increase the penalties. And the DA must refer to the grand jury if the DA doesn’t indict. Long term, let’s amend the constitution to include preemption as in New Mexico. The process will be longer and more difficult, but it will be just as difficult to undo. As things stand now, a perfect storm of gutless or morally bankrupt politicians can rush bills through as Florida did. Surely a gang of Democrats will gut Nevada’s protections next year, given the chance. Without Adam Laxalt as governor, we stand no chance. A Republican majority in the Legislature gives us hope, but is no guarantee. Nevada turns bluer every day as ill-informed Californians evacuate east and illegal immigration and illegal voting continues unabated. Chaos and civil war is only a matter of time; the Democrats and forces of darkness want you disarmed. The sober warning that hoplopathic politicians need to remember is that when you have disenfranchised conservatives, ruined them economically, and subjected them to crime and violence, this pseudo-minority will be desperate. Desperate people resort to desperate measures. Our nation was founded precisely because Parliament and King George utterly ignored the wishes of the colonies and reduced them to desperation. When you’ve taken away from the people the soap box and the ballot box, only the cartridge box is left. According to a post on Facebook made early Saturday afternoon, Henderson mom, Kari Campbell made a disturbing discovery during an Easter egg hunt. 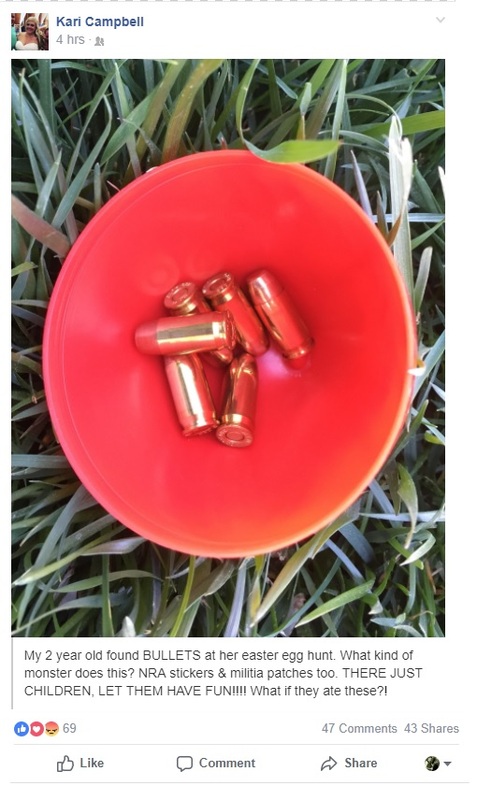 Apparently, some prankster put pistol cartridges, pro-2A patches, and NRA stickers in Easter eggs and hid them in the tall grass of the neighborhood park. By now, the original post must must have been scrubbed (based on the anti vs. pro gun debate raging in the post comments), but we’ve preserved it in all its hysterical glory. Looks like either 9mm or .380 ACP, what do you think? The theme of the complaints, other than kids might have eaten the rounds (not likely), was your typical mad-mom non-sense about “common sense” gun confiscation, March for Our Lives was last week, etc. One lady got shouted down for suggesting that there were only three or four such eggs and no one got hurt, considering the parents were following along with their children as they picked up the eggs. Henderson police investigated and booked the ammo, eggs, and the other stuff as evidence. They told Campbell that since no one got hurt, it was unlikely any laws were violated. She didn’t take it well. Well, you magnificent bastards who did this, I salute you. Happy Easter! More photos at the new blog.